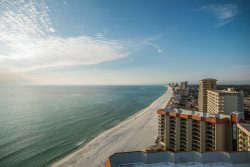 Our four bedroom, four bath penthouse condo is one of the few penthouses available for rental in Panama City Beach. With over 3300 square feet of living space and a 579 square foot balcony, you need look no further for a place for that perfect beach getaway! Penthouse, Penthouse, Penthouse! Need I Say More?